Found this and almost cried. 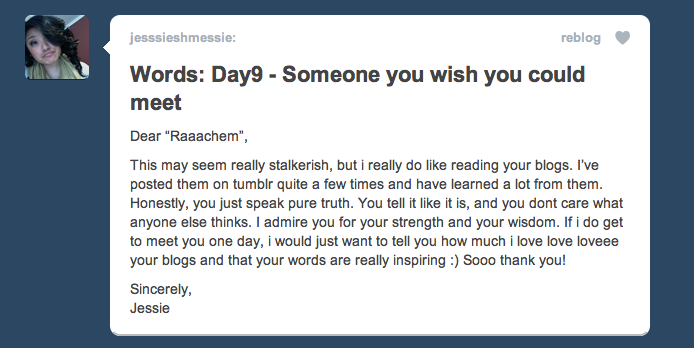 Jessie, wherever you are, know that you made my day..my week.. my month. HOLLA. and no, thank YOU. p.s. this is all the gay i have in me today. more coming soon. OMG! How did you find this?! I feel slightly embarrassed just because i did not expect you to read it, let alone post it on your blog! Haha.. But at the same time im really glad you did because your blogs really do inspire me, and im not ashamed of that. I guess its just kinda weird because i dont know you personally but I just feel like i can really relate to the things you write about. I’ve even shown them to my friends and all they can say is “damn..” hahaha. But seriously, keep doing what you’re doing. Real talk, it is greatly appreciated 🙂 Thank you! Jessie, I dont have a tumblr, but I check out tumblr a lot. I got curios the other day and searched my name and this came up. I’m BEYOND appreciative and flattered and real talk, you almost brought me to tears. I dont know you, but i love you. no homo. love it. love your posts. keep up the great work.. you are very smart & strong and lucky! I swear I’m not a stalker 🙂 I came across your blog from Wtforks.com because I am also a twilover and I thought you guys were nothing short of hilarious. So I got curious, and I have been glued to your blog since I discovered it. You’re insightful and inspiring. And I agree with the ladies above.